Carinity teachers and school support staff will rally alongside community supporters at the Lions Club Hall (95 Lister Street, Sunnybank) at 8:00am on Tuesday, 18 September 2018. Independent Education Union (IEU) members from Carinity Southside (Sunnybank) will take strike action during scheduled work hours to attend the rally and pass formal resolutions calling on Carinity to agree to arbitration of the negotiations, which began in June 2017. 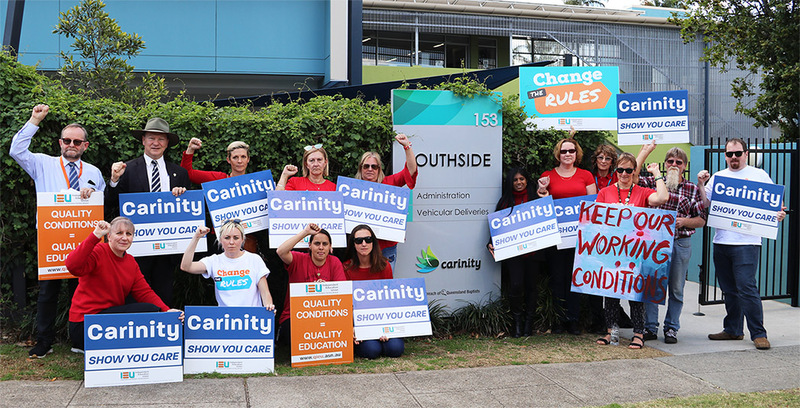 Carinity Glendyne staff in Hervey Bay will also be on strike and rallying during this time, passing the same resolutions as the Brisbane rally takes place. •	Employer will not provide reason for cuts, but maintains they are not due to financial concerns.